The Lindianet is no longer open. 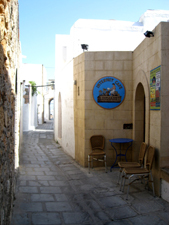 The availability of free Wi-Fi around the village has reduced the need for Internet cafes. I believe there is still an Internet cafe up the lane past the donkey station. I can't tell you whether or not it has a printer for printing boarding passes - you could always ask the owner of your accommodation if you need to do that.